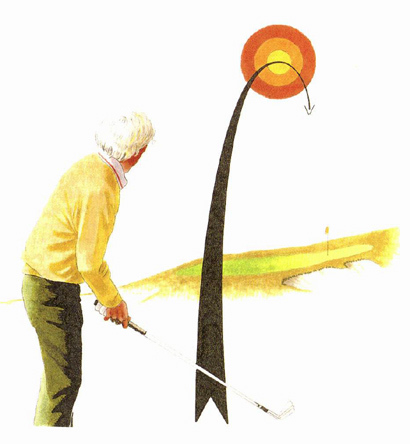 For most people, the key moment in the visualization process is the end of the shot, where they imagine the ball coming down in center of the fairway or next to the flag. I take a different view; for me, it's most important to visualize the apex of the shot I want to hit. After all, a golf shot is not a bullet, it's more akin to an arrow. Except on the shortest of putts, I'm always playing for some sort of break or allowing for the wind, or expecting some degree of fade or draw. If my mind is beamed in on the target, I might not give sufficient consideration to these factors. Subconsciously, I might start the ball straight at the target, only to see it drift or blow or roll off to the side. My goal is to make my ball reach the very height of its flight - or in the case of a fade or draw, the farthest point left or right in its curve. After all, this is as much as I'm able to make the ball do - ballistics and gravity do the rest.